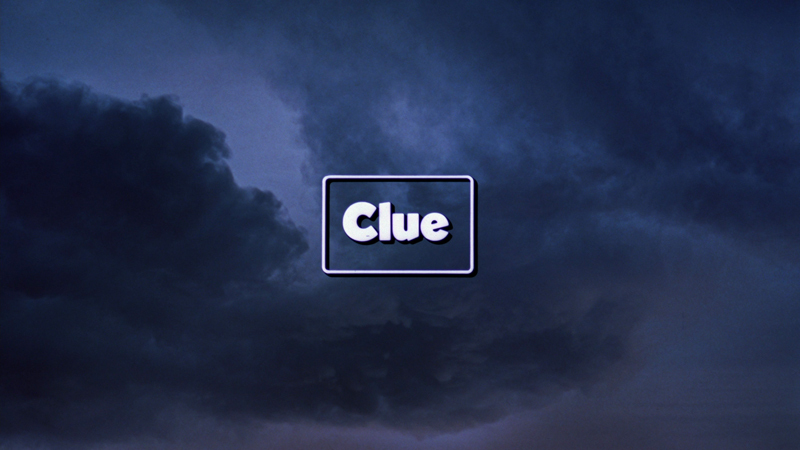 It seems like Clue finds its way before my eyes every now and then, and I remember that it's one of my favorite movies, starring some of my favorite actors, before it recedes into the archives of my memory, replaced by some other recent, fleetingly entertaining movie. But say the word "flames" or "I'm going home to sleep with my wife!" 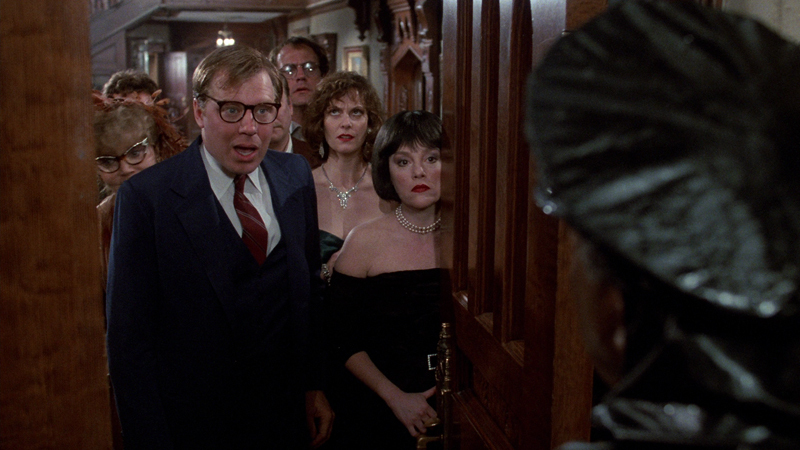 and Clue comes rushing back, reclaiming its rightful spot in my personal pantheon of cinema. In this way, Clue is a lot like air. If I didn't have it, I'd certainly miss it (though I might not die), but I don't appreciate it as much as I should. Amazingly, way before the box-office flame-out titled Battleship (and the upcoming and likely terrible Candy Land), making a game out of a board game could be a good idea. The only thing is you had to have a hugely-talented cast (as in no singer/actors or models/actors. Just actors.) and a game that had a hint of a plot. The game Clue was therefore far ahead of the rest of the boxes tucked in your closet, as the idea was to figure out which of the characters committed a murder, and in what room of the house and with what weapon. A murder mystery has been the plot for countless movies. Now, make it a comedy, and it potentially joins some very respectable company, if it's any good. Under the guidance of veteran British sitcom director Jonathan Lynn (who also wrote the script and co-wrote the story with John Landis) this story plays out as a classic mix of word play and slapstick, all tinted as a comedy of manners. Set in the '50s, amid McCarthyism and the "Red Scare" of Communism, the movie brings together six people at a secluded New England mansion, drawn by mysterious letters. Met by the housekeeper Wadsworth (Tim Curry), they begin to learn there's a connection between them, and when people start turning up murdered, they must work together to figure out who the killer is. Now, to be honest, the hunt for the murderer is just the opportunity to string together funny bits from the characters, and to set up the film's unique box-office hook, that you would see different endings at different theaters. But it doesn't get in the way of the comedy, and keeps things moving nicely. The comedy in Clue is undeniably classic, arriving via well-timed delivery from a cast of comedy veterans. There are so many set-up/punchline combinations that you become a bit punchdrunk from the laughs, and the physical comedy that follows feels even funnier. Everyone in the main cast makes a significant impression, starting with Curry (in what may be his best film performance ever) and running through the late Madeline Kahn, Michael McKean, Christopher Lloyd, Martin Mull, Leslie Anne Warren and Eileen Brennan (and even Colleen Camp as Yvette the French maid, though her impression is more physical than comedic.) Some of the runs in the dialogue flow like water, representing a kind of beautifully choreographed dialogue rarely seen in modern comedy, while Curry's explanations of how the murders were committed are just brilliant. Little bits of dialogue throughout are so perfect they'll stick with you, and you'll find yourself thinking "Mrs. Peacock was a man?" 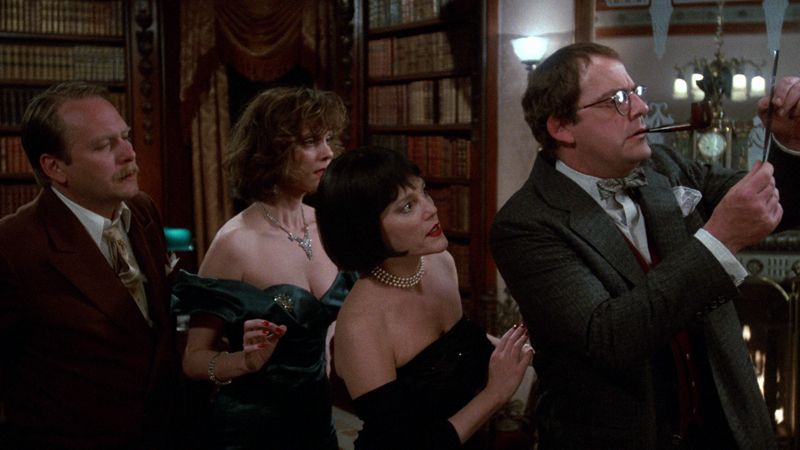 Clue arrives on a single Blu-Ray disc, which is packed in a standard Blu-Ray keepcase. The disc has a static menu with options to watch the film, select scenes, adjust the set-up and check out the extras. Audio options include a DTS-HD Master Audio 1.0 track, along with French, Spanish, and Portuguese Dolby Digital 1.0 tracks, while subtitles are available in English, English SDH, French, Spanish, and Portuguese. The 1080p AVC-encoded transfer makes Clue look as good as it's ever looked, even if it still doesn't look great, thanks to issues with darkness (which seem inherent in the source material, as the last third of the film looks fantastic.) Overall, the film looks its age, but not in a bad way, as there's a level of softness across the board, but it doesn't affect the fine detail much, as you'll see plenty of textures and intricacies (when the shadows and darkness allow it.) During the wrap-up, when somehow light creeps into the house (despite it still being late at night) everything looks incredible, to the point where it almost looks like an entirely different film. Across the board, there are no issues with compression artifacts, and there's not a speck of noticeable dirt. which is outstanding for an older catalog release of a Tier-B film. Though the disc indicates the sound is presented as a DTS-HD Master Audio mono track, it reads in player as a 2.0 track. Either way, everything comes from the center channel, presenting the dialogue and sound effects, plus John Morris' excellent score, clearly. The odd audio defects heard in the previous DVD release, which include some tinny, echoing lines in the main hallway, return in this release, but everything else is generally good, especially the music, It's certainly not the highest-end audio, but it does the job when it comes to the fun dialogue and exaggerated sound effects. It's not likely anyone was expecting any real extras here, and you're not getting anything that wasn't on the DVD. The three endings of the film can be randomly presented, or you can watch the film with the home-video ending, which included all three. The film's theatrical trailer has also been included, and though it doesn't look as good as the main feature, it's in pretty good shape, and is just what you'd expect from a trailer of its age (why no one has done a retro trailer like this for a modern film is a mystery of its own.) It would have been nice to hear from anyone involved with the film, particularly the stars. Clue remains an outstanding, smart comedy 27 years after it hit theaters with its unique random endings, and now it's got a high-end presentation to match, though the lack of bonus features is frustrating. If you don't own it, there's no reason to not add this release to your collection to enjoy again and again, and if you've never experienced it, you owe it to yourself to pop it into your player. 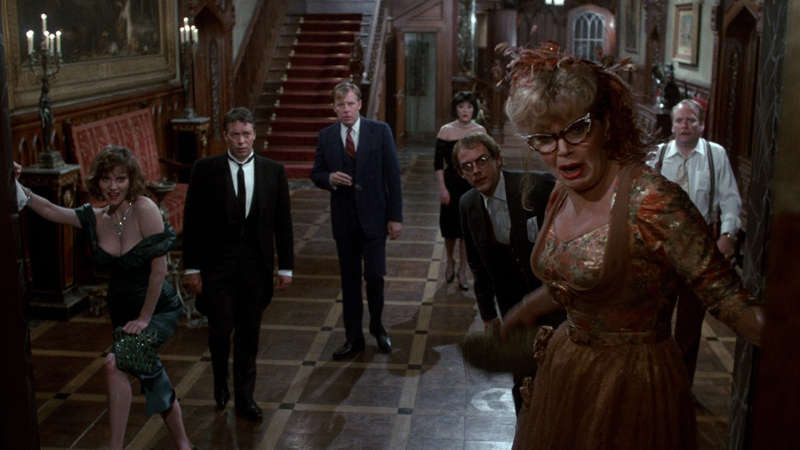 There are few modern comedies as continuously hilarious as Clue.